Isabel Egenton Ostrande (1885-1924), who also wrote as "Robert Orr Chipperfield," "David Fox," and "Douglas Grant," wrote Ashes to Ashes (1919). 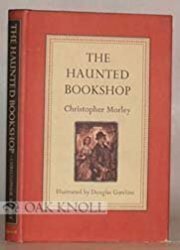 Dorothy Sayers calls it "...an almost unique example of the detective story told from the point of view of the hunted rather than the hunter." The Notorious Sophie Lang (1925) -- Charles Honce tells us "Sophie's real life counterpart was a famous New York woman thief. She purchased many copies of the book." The Notorious Sophie Lang was a series of related short stories. Deputy Parr of the New York police appeared in both series, then was given a series of his own beginning in 1921. 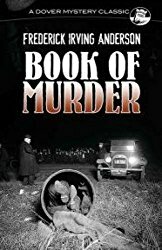 The Book of Murder (1930) collects the Parr stories, which were originally published in The Saturday Evening Post. Haycraft writes that Anderson "has shown perhaps the greatest mastery of the American short detective story of any writer since Melville Davisson Post, whom he closely resembles in ingenuity, command of plot, and the carefully integrated backgrounds of his work" (Murder for Pleasure). Octavus Roy Cohen (b. 1891- ). His detective (a "private agent") is Jim Hanvey. Hanvey is "Ponderous, uncouth, but ingratiating...." The Hanvey stories followed " 'slick' magazine formula-fiction" (Haycraft,Murder for Pleasure). Ernest M. Poate created his detective, Dr. Bentiron. Willard Huntington Wright tells us, "...the figure of Dr. Bentiron -- an eccentric but lovable psychopathologist -- will long remain in the memory of those who make his acquaintance" (The Great Detective Stories). James Hay, Jr. (1881-1936) created Jefferson Hastings. Lee Thayer (b. 1874- ) created her detective Peter Clancy. 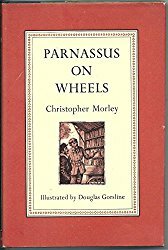 Hulbert Footner wrote about Madame Storey "a favorite of so particular and experienced a reader as Christopher Morley" (Murder for Pleasure). Natalie Sumner Lincoln (1881-1935)-- "most of her numerous novels belong to the romance-mystery category; a few qualify as detection for its own sake" (Murder for Pleasure). Vincent Starrett (b. 1886- ) "has produced from time to time some ingenious examples of plain and fancy sleuthing...." (Murder for Pleasure). Ben Ames Williams (b. 1889- )"has written excellent tales which escape being detection by only a narrow margin" (Murder for Pleasure). Arthur Somers Roche (1883-1935)-- his works resemble those of Louis Joseph Vance (who wrote about The Lone Wolf). T.S. Stribling (b. 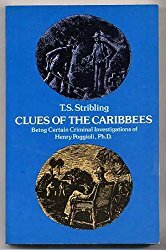 1881- ) wrote Clues of the Caribbees (1929), his "single and too little known volume of Poggioli tales" (Murder for Pleasure). Charles Honce says the concluding story "is positively thunderous; it will knock you right out of your seat." Frances Noyes Hart (b. 1890- ). 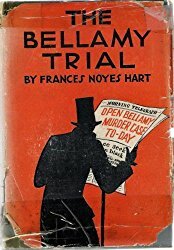 The Bellamy Trial (1927)was a day-by-day account of a murder trial; Hide in the Dark (1929) is "credited with popularizing the parlor game 'Murder' (or vice versa)" (Murder for Pleasure). Willard Huntington Wright took the pseudonym "S.S. Van Dine" to produce a dozen Philo Vance novels. Haycraft tells us that Wright "rejuvenated and re-established the genre in his native land." For a few years Vance was "the best known fictional sleuth on the globe." The Philo Vance books have great literacy and a high degree of verisimilitude, but he was "a developer, an adapter and polisher of other men's techniques, rather than a true innovator" (Murder for Pleasure). 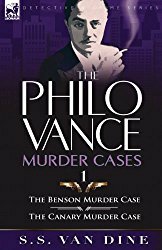 Needs a kick in the pance"
The Benson Murder Case (1926)	was the first Philo Vance novel (though not Wright's first novel). The Great Detectives (1927)	is "his notable anthology...with an analytical introduction which remains one of the finest pieces of detective criticism ever written" (Howard Haycraft, Murder for Pleasure). The "Canary" Murder Case (1927)	was the second Vance investigation. The Gracie Allen Murder Case (the second to last Vance book). The Thin Man (1932)	-- the most popular of his works; "one of the first works to bring humor, and of a distinctly native brand, to the detective story in this country"; "As straightaway detective stories they can hold their own with the best"; "They established new standards for realism in the genre";- "...no other author of modern times -- certainly no other American -- has so basically changed and influenced the form" -- ( all of these quotes are from Howard Haycraft, Murder for Pleasure). William Powell and Myrna Loy made six films as "a couple who actually enjoyed marriage" (to paraphrase a comment Cecil B. Demille once made). 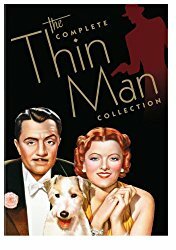 A box set of the six films is available as The Complete Thin Man Film Collection on DVD. 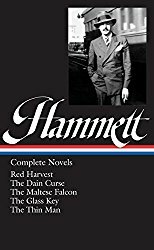 Or you can get The Complete Hammett Novels	in one volume. "Without him [Dashiell Hammett] there might not have been a regional mystery as clever as Percival Wilde's Inquest, or an ironic study as able as Raymond Postgate's Verdict of Twelve, or a savage piece of intellectual double-talk like Kenneth Fearing's The Dagger of the Mind, or a tragi-comic idealization of the murderer as in Donald Henderson's Mr. Bowling Buys a Newspaper, or even a gay and intriguing Hollywoodian gambol like Richard Sale's Lazarus No. 7" (Raymond Chandler, "The Simple Art of Murder") . Ellery Queen is the name of both author and sleuth, who wrote "adventures in deduction" that are "entirely American in their idiom." The Ellery Queen tales are a successful blending of the Van Dine and Hammett schools. "The Queen stories...represent some of the most competent writing that has been done on this side of the water in the field of the deductive tale contrived for purely entertainment purposes" and "One of the most successful collaborations in contemporary writing" (Howard Haycraft, Murder for Pleasure). The name "Ellery Queen" is a pseudonym for cousins Frederic Dannay and Manfred B. Lee (both b. 1905). The Roman Hat Mystery (1929)	was their first of some forty books published under the Ellery Queen name. "Ellery Queen has been uncovering murders and untangling mysteries with such suavity and sophistication that he has become one of the most popular fictional sleuths extant" (News-Week). Dannay and Lee also created Drury Lane (detective); for this short series (which consisted of only four novels), they took the name "Barnaby Ross" as their pseudonym. "Ellery Queen is to-day deservedly one of the two or three best known names in American detective fiction" (Howard Haycraft, Murder for Pleasure). Challenge to the Reader (a Queen anthology) -- I, personally, love this book. In it, the Queens anthologize some classic detective stories. But they change the name of the author for each story, and they change the name of the detective. The challenge is for you, as a reader, to try to match the story with a well-known fictional detective and/or author (such as Sherlock Holmes and Sir Arthur Conan Doyle). Even more stimulating for me is the fact that some authors who have been inaccessible are included (for example, the "Astro" tales that I had read so much about but was unable to find -- until I came across this anthology). "The Queens' have never failed to give their multitude of followers honest merchandise" with an "absolutely logical" fair-play method of deduction (Haycraft, Murder for Pleasure). Earl Derr Biggers (b. 1884) created Charlie Chan (his detective). 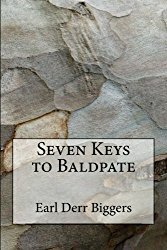 Biggers had written a hugely successful mystery called Seven Keys to Baldpate (1913) (not a Chan). The House Without a Key (1925)	was the first Chan book. There are no Chan short stories. In an age when we have become sensitive to stereotyping, some people may be offended by a discussion of a Chinese detective who was created by a caucasian man with no real knowledge of the Chinese culture or people. To place this in the context of the day, some Western writers were creating stories and characters out of pure ignorance and imagination. Oriental characters were often painted as sinister. Earl Derr Biggers reacted to this by creating the opposite type. I don't believe any malice was intended at the time -- many people simply lacked the awareness to question stereotypes and accepted whole cloth whatever ideas were circulating. Biggers said about his character, "Sinister and wicked Chinese are old stuff...but an amiable Chinese on the side of law and order had never been used." He also said, "If I understand Charlie Chan correctly, he has an idea that if you understand a man's character you can nearly predict what he is apt to do in any set of circumstances." 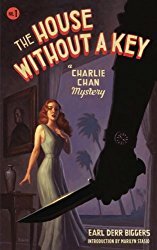 Haycraft says the Charlie Chan stories are "clean, humorous, unpretentious, more than a little romantic, and -- it must be confessed -- just a shade mechanical and old-fashioned by modern plot standards" (Murder for Pleasure). By "modern plot standards," Haycraft was referring to the standards of the 1940s, so even then Biggers's writing was considered old-fashioned. And the Charlie Chan movies became hugely successful -- more movies were made about Charlie Chan than about almost any other fictional detective. I must confess that when I was a boy ethnic stereotypes were lost on me. I was unaware that others might be offended by the character of Charlie Chan, and I personally found him endearing.